From late winter to summer 2011, the U.S. Geological Survey Arid Lands Field Station conducted mist-netting efforts at El Malpais National Monument and on adjacent lands belonging to Bureau of Land Management and U.S. Forest Service to detect the occurrence of white-nose syndrome or causal fungal agent (Geomyces destructans). During this assessment, 421 bats belonging to 8 species were documented at El Malpais National Monument and adjacent lands. None of these captures showed evidence for the presence of white-nose syndrome or G. destructans, but it is possible that the subtle signs of some infections may not have been observed. Throughout the field efforts, Laguna de Juan Garcia was the only water source located on El Malpais National Monument and was netted on June 20 and 27, July 25, and August 2, 2011. During these dates, a total of 155 bats were captured, belonging to eight species including: Corynorhinus townsendii (Townsend’s Big-Eared Bat), Eptesicus fuscus (Big Brown Bat), Lasionycterics noctivagans (Silver-Haired Bat), Myotis ciliolabrum (Small-Footed Myotis), M. evotis (Long-eared myotis), M. thysanodes (Fringed Myotis), M. volans (Long-Legged Myotis), and Tadarida brasiliensis (Brazilian Free-Tailed Bat). Overall, Laguna de Juan Garcia had the greatest number of captures (79 bats) during one night compared to the other sites netted on adjacent lands and had the greatest species diversity of 8 species netted, not including Euderma maculatum (Spotted Bat) that was detected by its audible calls as it flew overhead. Laguna de Juan Garcia is an important site to bats because of its accessibility by all known occurring species, including the less-maneuverable T. brasiliensis that is known to form large colonies in the park. Laguna de Juan Garcia is also important as a more permanent water source during drought conditions in the earlier part of the spring and summer, as observed in 2011. 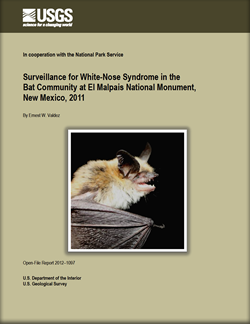 Valdez, E.W., 2012, Surveillance for White-Nose Syndrome in the bat community at El Malpais National Monument, New Mexico, 2011: U.S. Geological Survey Open-File Report 2012–1097, 37 p.